Founding father and first president of the United States George Washington did it. Many after him did it out of necessity. 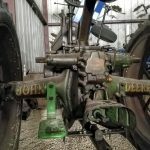 Farmers in the 1700’s and 1800’s found themselves with a dilemma. 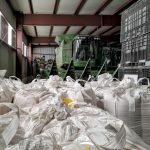 They were harvesting excess grain from their farms and couldn’t preserve or transport all of it before it succumbed to mold or rot. 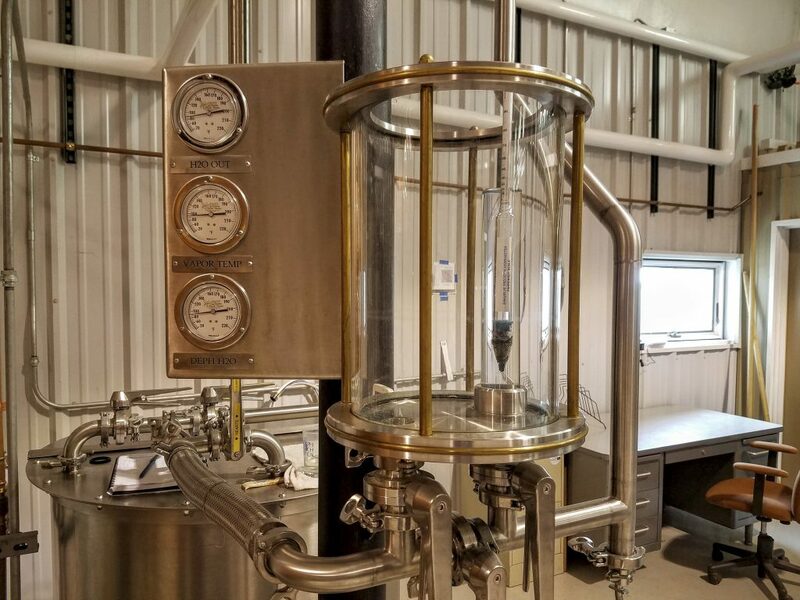 A solution they discovered was to mill, mash, ferment, and distill their corn and other grains to make a liquid alcohol that would come to be known as whiskey. Whiskey lasts much longer than raw grain and was easier to store and transport due to its condensed size. (Around this time farmers would have chopped down trees to fashion their own wooden containers to store whiskey.) When prohibition came along in 1920 farm distilling disappeared and never made much of a comeback, until now. 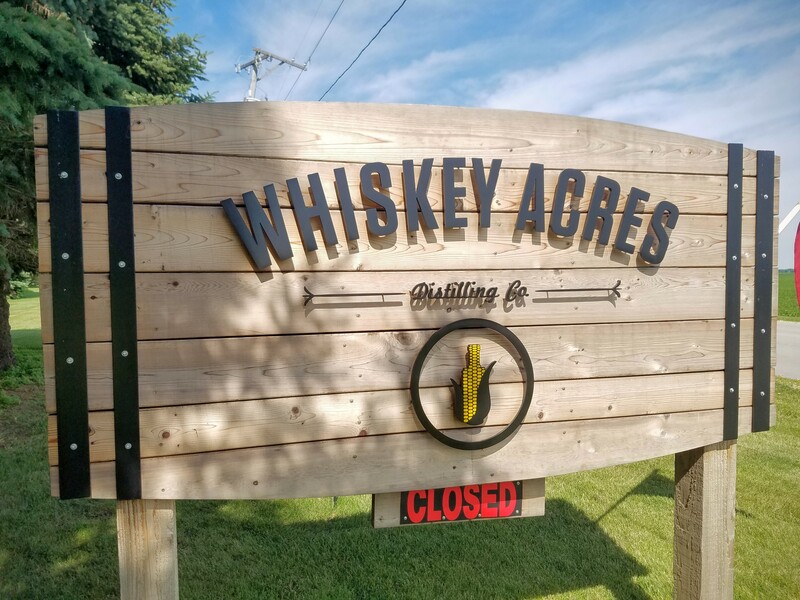 Whiskey Acres tasting room, distillery, and picnic area. 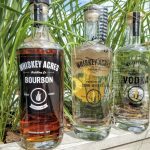 Whiskey Acres in Dekalb, IL is the first and currently only American Distilling Institute certified farm distillery in Illinois. As of today, one of only several in the country. 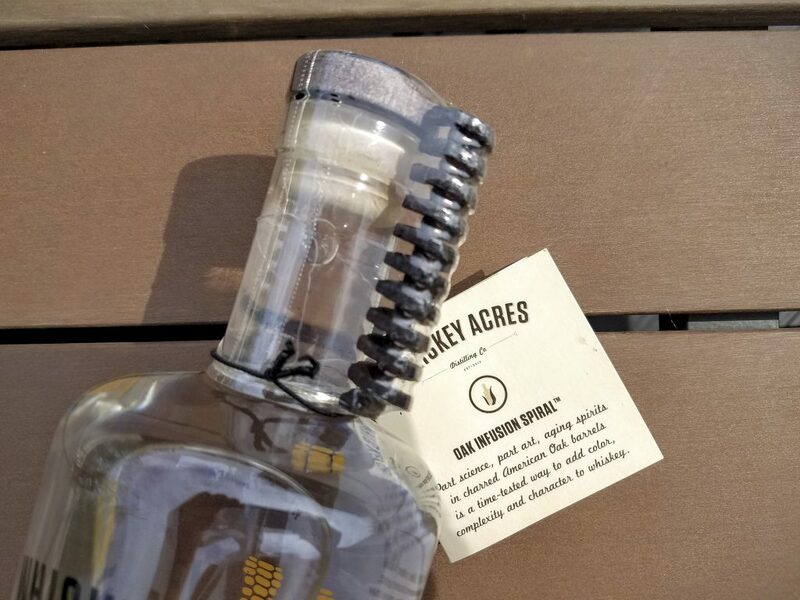 Located on Walter Farms just 60 miles West of Chicago, Whiskey Acres embodies the traditional idea of a farm distillery. 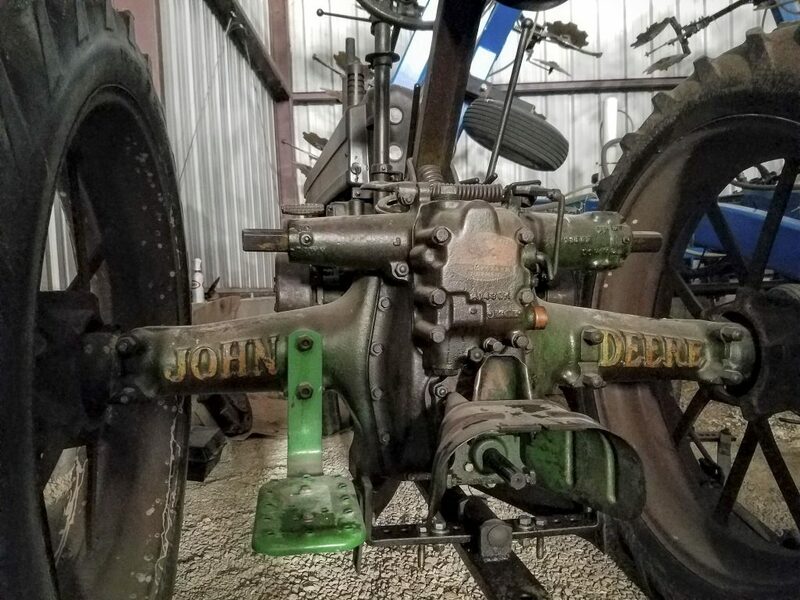 Operated by Jim Walter, his son Jamie, and their business partner Nick Nagele. 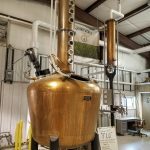 The idea for the distillery came to them in 2011 after an Illinois law relaxing craft distillery regulation passed in 2010. 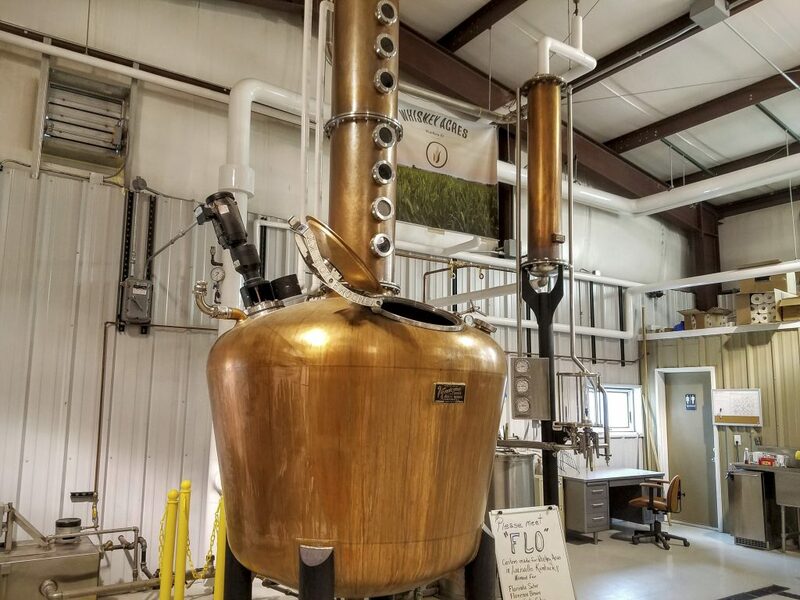 After gaining all necessary permits, and overcoming local hurdles unique to their farm distillery setup, their copper still was up and running the week before Christmas 2014. They came to market with their first product in February 2015. Whiskey Acres isn’t interested in sourcing whiskey. “Everything will be transparent here. Anything that we sell you in a bottle is from seed to spirit.”, says Jim. 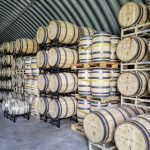 Why is the summer of 2016 an important time for Whiskey Acres? The very first release of their prized bourbon hit shelves on June 4th of this year. And we aren’t throwing around the term “prized”. 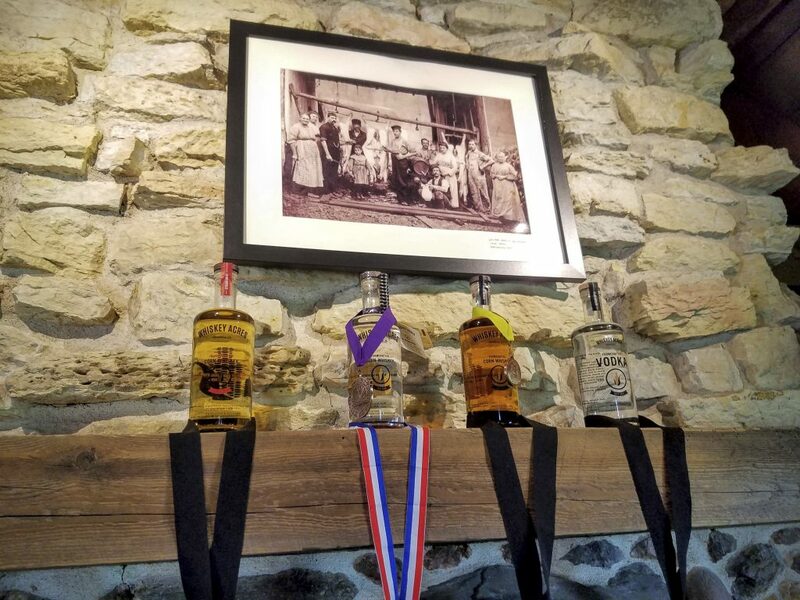 Their bourbon took a silver medal at the San Francisco World Spirits Competition and bronze at the American Craft Spirits Competition. Bottles displayed with their numerous awards. Above is an authentic family photo of Jim’s great grandmother and great grandfather. When we arrived at Whiskey Acres we were greeted by Jim Walter, a lifelong farmer. 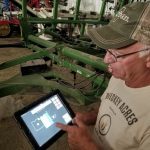 Jim has been farming this land for over 46 years. He tells us that he and his family have always wanted to do something more to capitalize on their high quality grain. For a time they shipped corn to Sapporo in Japan to be used in beer. They have raised soybeans, and vegetable crops for Del Monte. Jim’s son and partner at Whiskey Acres, Jamie Walter, practiced law for a year before dabbling in winemaking in California then returning to the family farm to become the 5th generation to farm here. Jim joking describes his son as a “recovering attorney”. As Jim led us through the distillery and into one of several barns we could tell this wasn’t going to be your run of the mill distillery tour. You see, Whiskey Acres isn’t your run of the mill distillery. In true spirit of their moto, “Great whiskey isn’t made, it’s grown”, we began our tour on the farm. 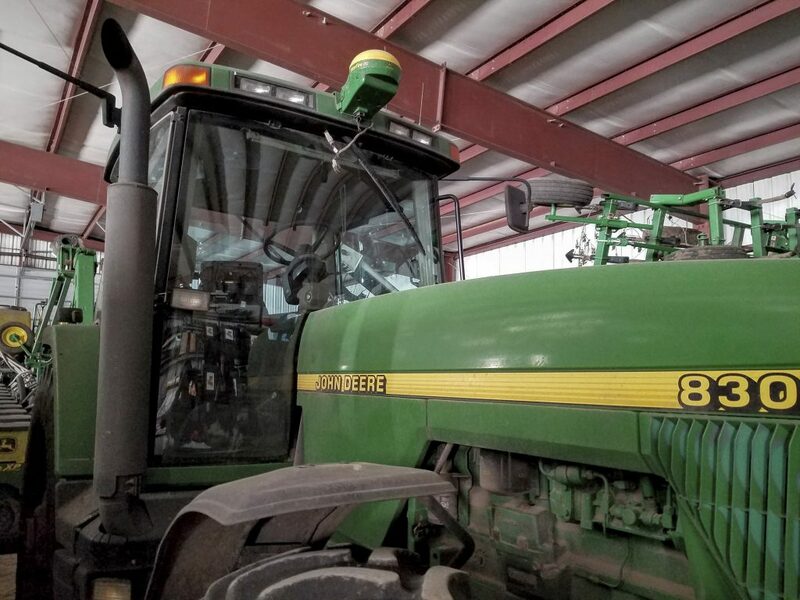 Jim showed us the gigantic John Deere tractors and combines used to plant, fertilize, and harvest their crops. 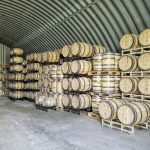 He told us how everything is computerized, “There’s an awful lot of technology in place today that we’re going to be able to feed into the distillery. That’s how we’re going to make sure we have the superior corn stock.” They currently raise several varieties of corn, wheat, and rye. The only whiskey ingredient they don’t grow is barley. While they could grow barley Jim tells us they don’t have the facilities to malt it. Instead they purchase malted barley from a nearby producer. Jim primarily runs the farm side of the operation. Jamie is the President and CEO of the Whiskey Acres Distilling Co. and has done most of the research for the distillery. Jamie’s wife works in the farm/distillery office, talk about a family business! It doesn’t get any more craft than this! Nick Nagele is a co-founder, lead distiller, and head of marketing. Rob Wallace is their assistant distiller. While Jim is a lifelong farmer with the most experience out of the bunch. All three partners, Jamie and Nick included, are farmers first. This is where Dave Pickerell comes into their story. You probably recognize that name. Dave Pickerell was the Master Distiller at Maker’s Mark for 15 years. He grew Maker’s Mark from a craft size distillery to the worldwide brand it is today. Dave is also heavily involved in Hillrock Estate as their Master Distiller and with WhistlePig. In the past he’s worked with Vendome Copper & Brass as well as countless other bourbon related endeavours. 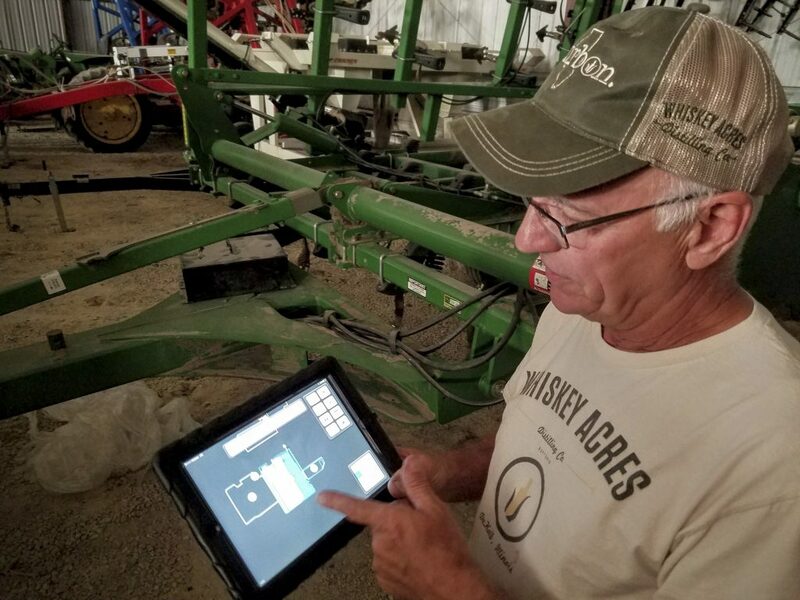 Dave Pickerell was brought on as a consultant at Whiskey Acres about 4 years ago. Jim tells us that he was excited to get involved at the very beginning of their budding distillery. He helped them with everything from the still design, to water and rickhouse evaluation. Dave has been out to the farm numerous times including a week spent distilling and return visits to sample barrels. The final ingredient that they do harvest from the farm is the water. All water used at the distillery comes from an aquifer under the farm. Not something you’ll find in the big city! This leads to one of many examples of the farmers ingenuity this team possesses. The water well on the farm is a narrow 6 inches in diameter. They were planning to drill a larger well but after a water analysis, and Mr. Pickerell, told them their current well water was perfect they decided not to risk a change. Instead they designed the distillery to use very little water. Other craft distilleries can use up to 30,000 gallons of water per day to cool, dump, distill etc. Whiskey Acres uses about 400 to 500 gallons a day, with 375 gallons actually recycled and used as an ingredient for their mash cook. The only water they lose is what’s used to wash the tanks. Once done distilling, the leftover wash, or backset, made of grain and water is used as cattle feed. All the local cattle prefer the feed coming from the Walter Farm! As we walked towards the fields to check out the crops that will become whiskey Jim tells us the distillery only uses the top 5% of the grain they harvest. 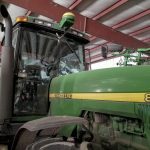 The bottom 95% that doesn’t make the cut is sold off to a local ethanol plant or used for animal feed. 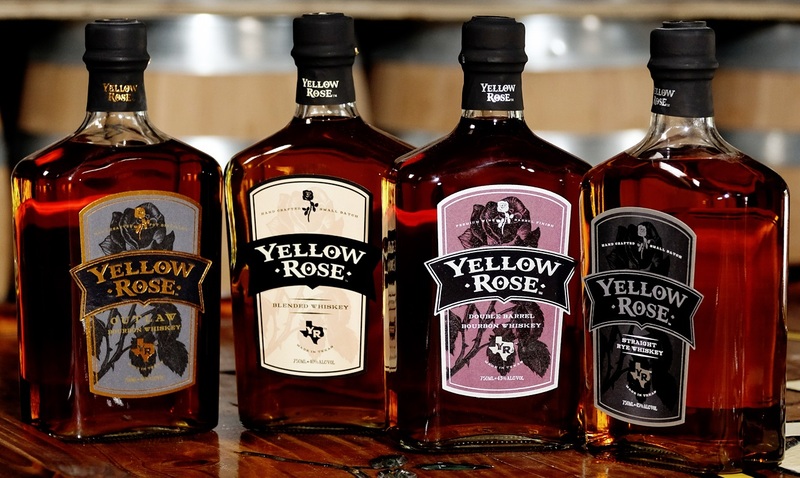 Only the very best of the several thousand acres they farm makes it into the whiskey and bourbon you’ll drink. I asked Jim and Jamie why they decided to make bourbon. (Afterall, we know it’s a great idea) They told us that being so close to Chicago and the surrounding suburbs they wanted to make a product they can sell locally. 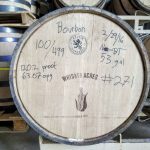 Farming provides the opportunity to do some unique things when it comes to bourbon. When you’re raising the grain from seed to spirit you have the opportunity to identify flavor profiles of various corn varieties. Speaking of grain variety, our next stop was the “demo plots”. 98% of corn produced is yellow dent. Primarily used for ethanol, animal feed, and food stocks. 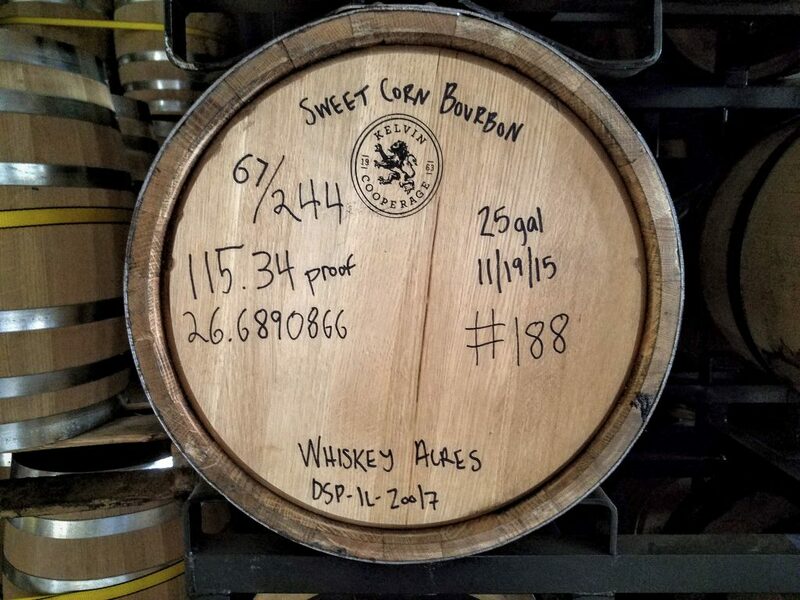 At Whiskey Acres they use specific varieties of yellow dent corn they have identified as probable to produce a great bourbon. Then they take things a step further. A year ago they began raising blue popcorn, sweet corn, and Oaxacan green heirloom corn from Mexico. “We were so enamoured with this [blue popcorn] coming off of the still last year that we decided to plant more of it.”, said Jim. All of these are used for bourbon and all are currently aging in their rickhouse. 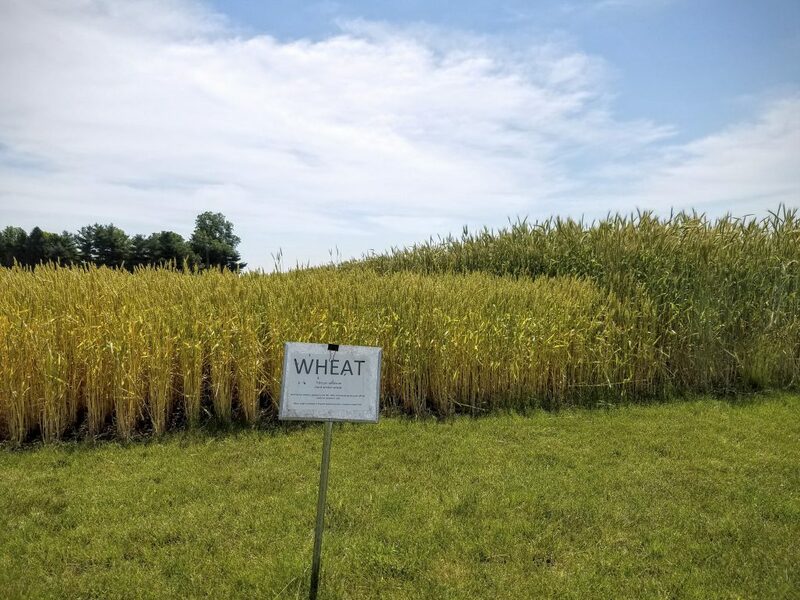 A demo plot of wheat alongside numerous plots of rye and corn. 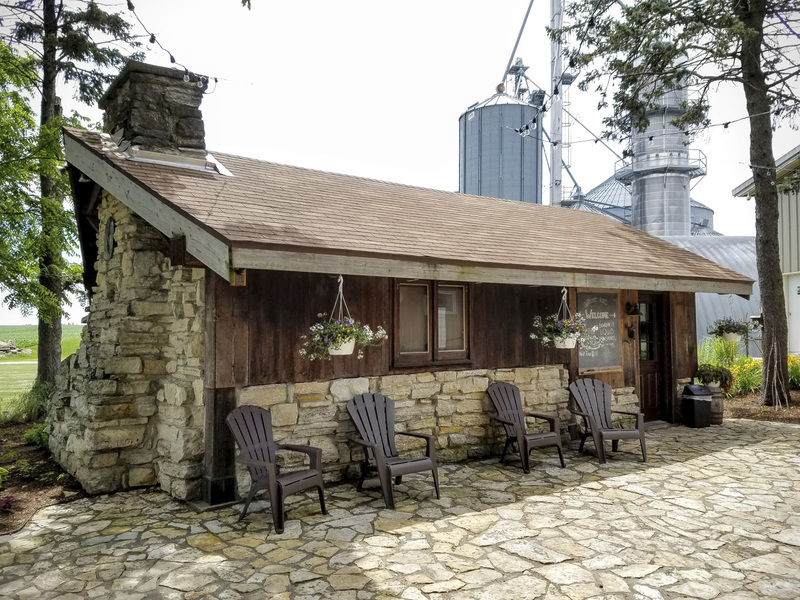 The rickhouse is an unassuming domed structure tucked between grain silos and equipment barns. 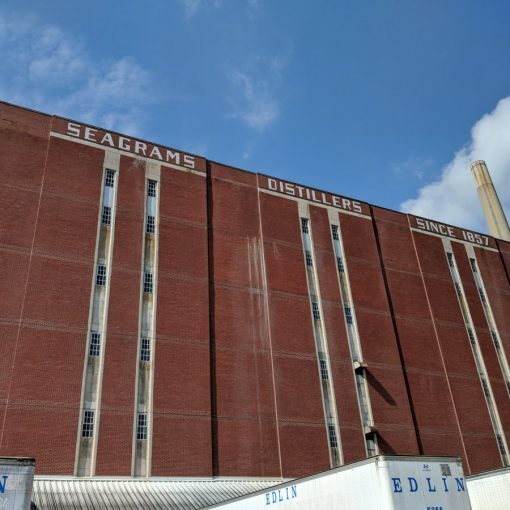 It was built roughly 60 years ago to store grain. 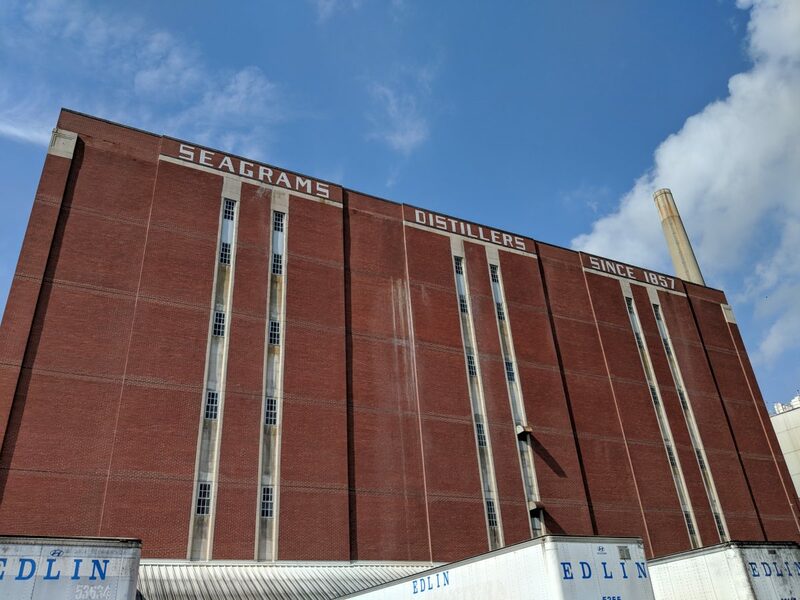 The men suspected it’s corrugated steel walls and domed shape would be ideal for aging bourbon, Mr. Pickerell agreed. The midwest sun beats down causing the rickhouse to get incredibly hot most of the summer. Today the rickhouse is home to a variety of barrel sizes sourced from Kelvin Cooperage and Barrel Mill. 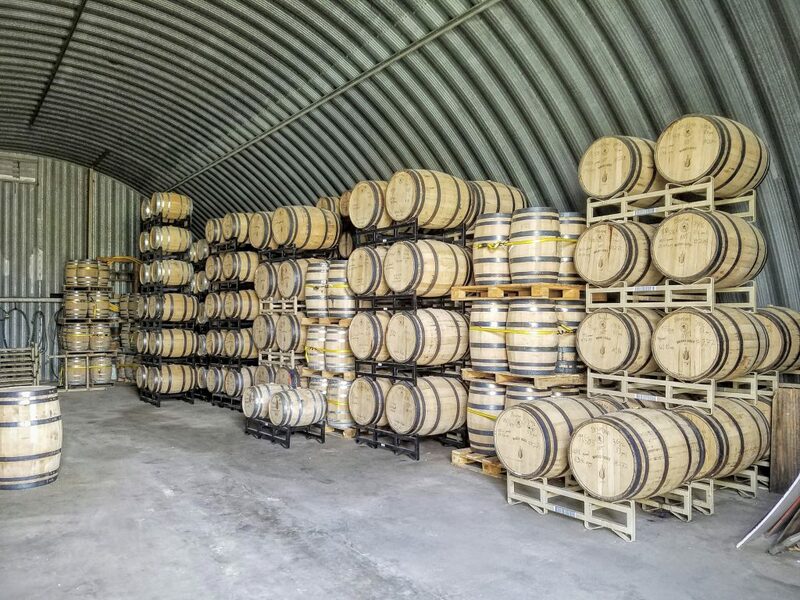 The goal is to move to all 53 gallon barrels. “I’m learning a lot about repairing barrels.”, says Jim, “We were surprised when dumping barrels that we had more loss than we anticipated. 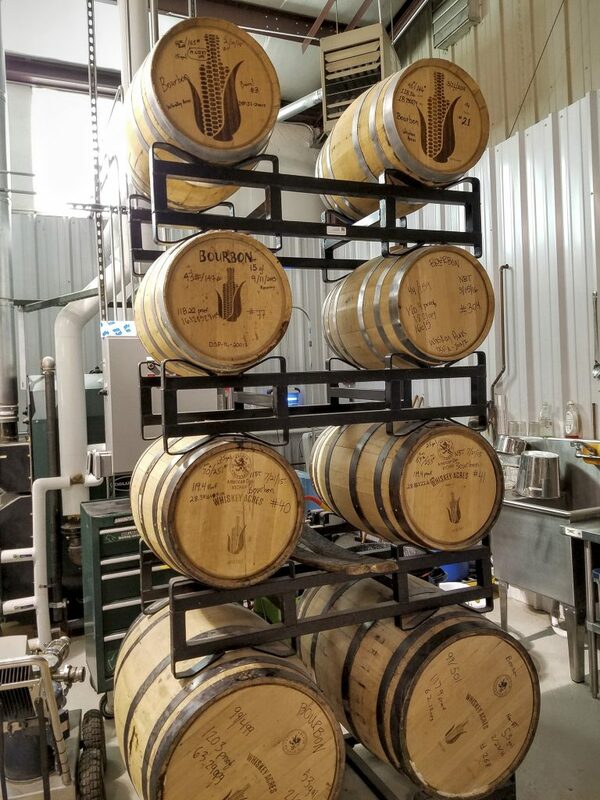 Part of it was that we were not up to speed on watching the repair work.” Barrels we saw aging in the rickhouse include bourbon made from sweet corn, Oaxacan Green, blue popcorn, yellow dent, and even some rye whiskey. But despite their initial intentions, whiskey isn’t the only spirit they distill. The tasting room. Purchased by Jim’s father, it used to be a dairy barn. Eventually it was torn down and the wood was used to build what is now the tasting room. Corn Whiskey including the oak infusion spiral. Next came the bourbon which we were most looking forward to trying. With a mashbill of 75% corn, 15% wheat, and 10% malted barley. The first release produced 240 cases aged about 15 months in 15 gallon barrels with a #3 char. It’s non-chill filtered and bottled at 87 proof. This precise formula of recipe and time was chosen by Whiskey Acres with the assistance of Mr. Pickerell. The nose is bold, the grain profile comes through once again. This time with some oak and warm vanilla. The nose is balanced and the oak is enjoyable rather than overpowering. At first I picked up some oak, corn, vanilla, and a little spice. The corn combined with the wheat makes for a smooth sip. The palate has a depth not found in most younger bourbons. 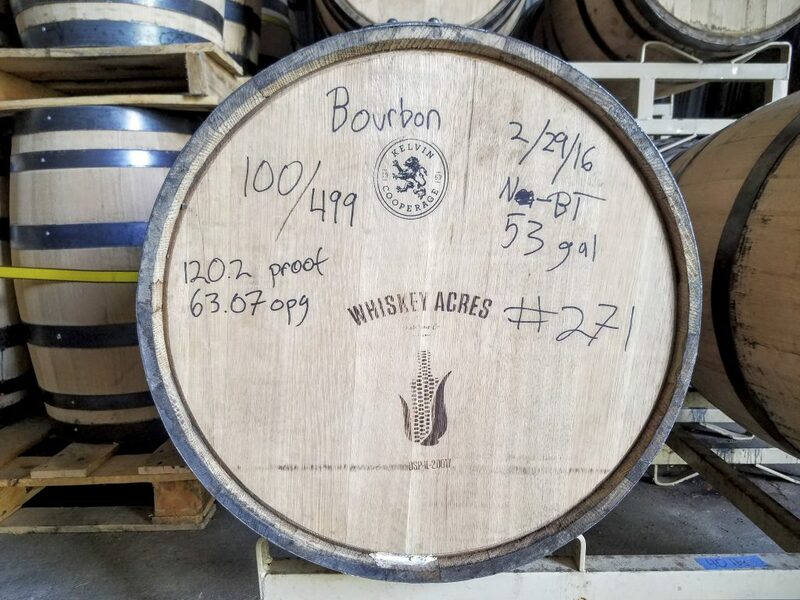 Whiskey Acres is very proud of this bourbon and looking forward to future releases being even better. 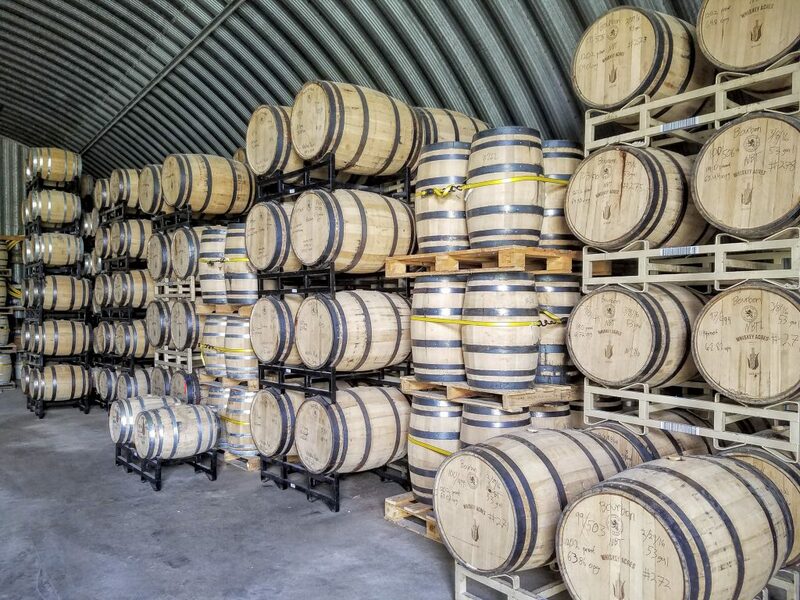 People say that bourbon gets all of its color and most of its flavor from the barrel. 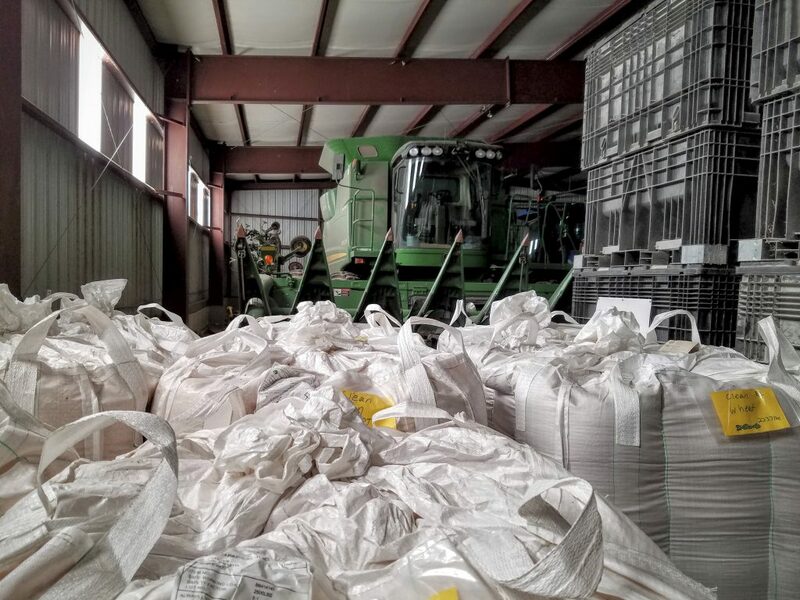 Whiskey Acres is on their way to showing us just how much of an impact grain can have on the end product. Around this time Jamie made his way back from fertilizing the fields to meet us. The perfect time to head into the distillery. Their still is a custom 500 gallon Vendome hybrid. It was designed in partnership with Mr. Pickerell to have 8 trays instead of the standard 4 trays. 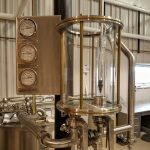 This allows them to skip the stripping run and distill the whiskey in a single on-grain pass. Retaining the impressive grain flavor they’ve worked so hard to grow. Jamie tells us that their initial distillation runs took up to 14 hours. As they have refined their process, a typical run now takes less than 6. While showing us around Jim and Jamie weren’t shy to tell us they are still learning the distillery operation. The best and most exciting times, as they said, are yet to come. 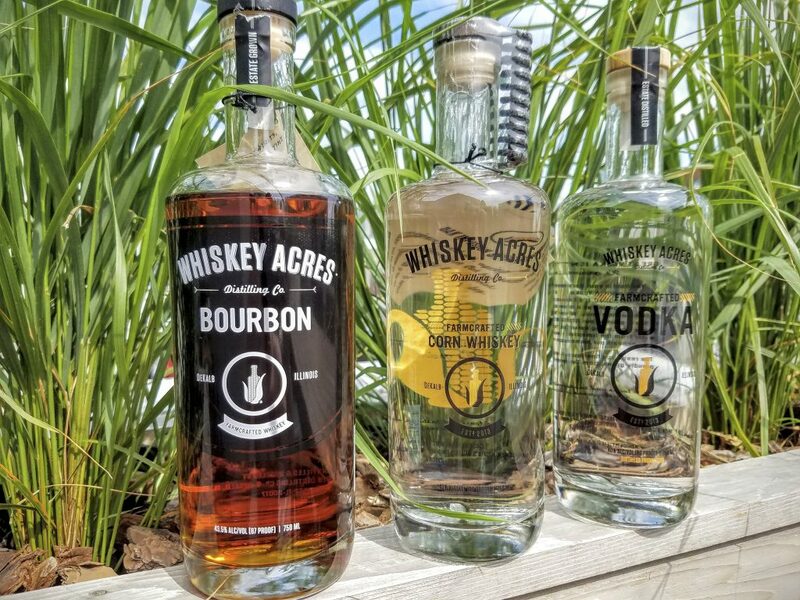 The full Whiskey Acres product line is now on store shelves. You can find it at Chicago area Binny’s and Lincoln Park’s Ezra’s to name a few. One retailer, John McIntyre – Manager of Sycamore Hy-Vee Wine and Spirits, has already chosen to bottle a single barrel selection. 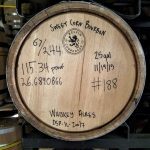 He tasted 15 barrels and chose one to put on the shelf of his store alongside the standard Whiskey Acres Bourbon. He’s planning to take the used barrel to Cademon Brewing in Genoa, IL and age their stout beer which he will market as well. He then wants to bring the used stout barrel back to Whiskey Acres to use to finish another single barrel bourbon selection. We’ve got to meet this mad bourbon scientist! 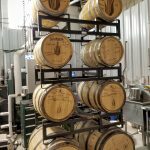 Future plans for Whiskey Acres include a Rye release, as well as a the blue popcorn bourbon they have aging now. Mr. Pickerell’s excitement for the current rye whiskey comeback will no doubt lead to superior rye’s coming from the distilleries he works with. Possibly most interesting however is their interest in terroir, investigating all of the environmental factors that contribute to crop production. 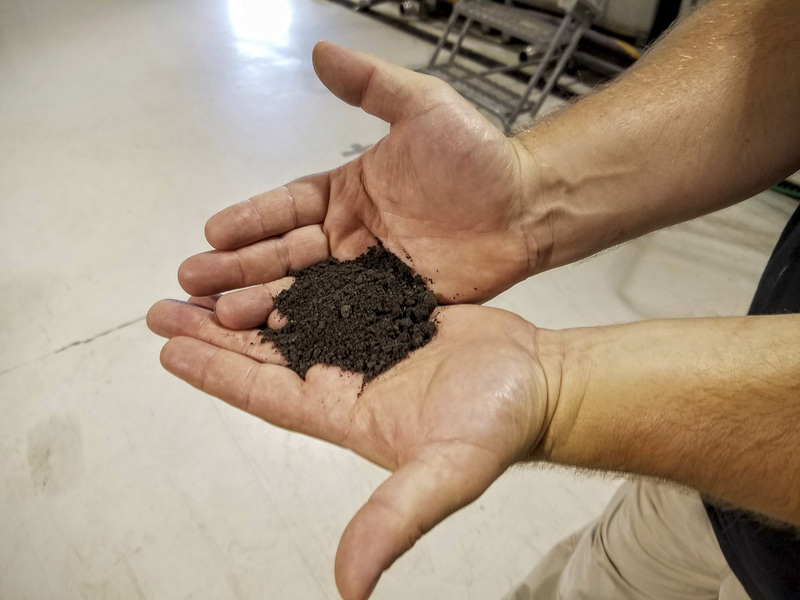 Including creating the best soil environment to produce the best corn. This is one reason Dave Pickerell got involved. I was told he was interested in exploring this during his time at Maker’s Mark and has done so with Hillrock Estate as well. A soil sample Jamie showed us. Part of their terroir efforts. Through our visit to Whiskey Acres it was evident that these guys are passionate about every aspect of whiskey production. And they like to have a good time doing it. Keep an eye on their Facebook page for a shout out for volunteers to bottle whiskey, eat pizza, and listen to music. Another great example of their commitment to community involvement and to having fun. 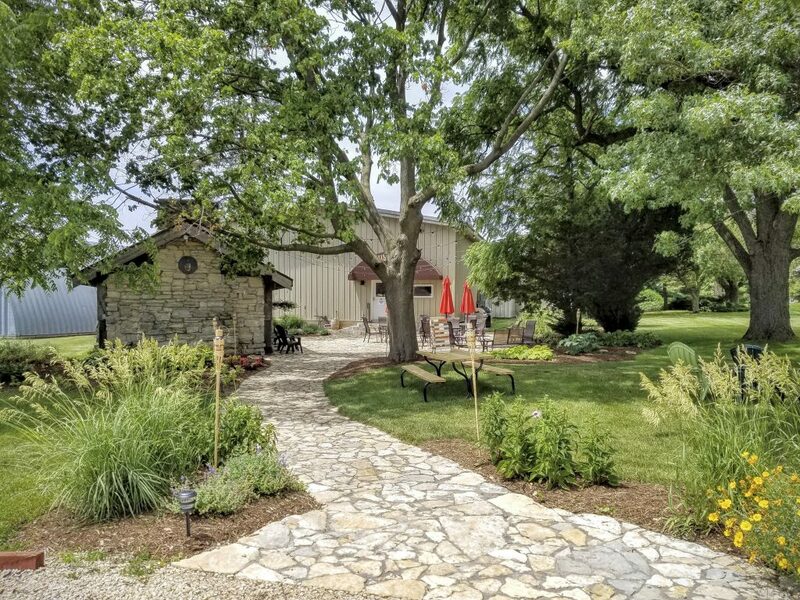 Their beautiful farm and distillery is open to the public and welcomes friends and families to tour, sample, and buy their products. They host gatherings, barbeques, and picnics as well. Head over to their website for visitors information and to sign up for their newsletter. 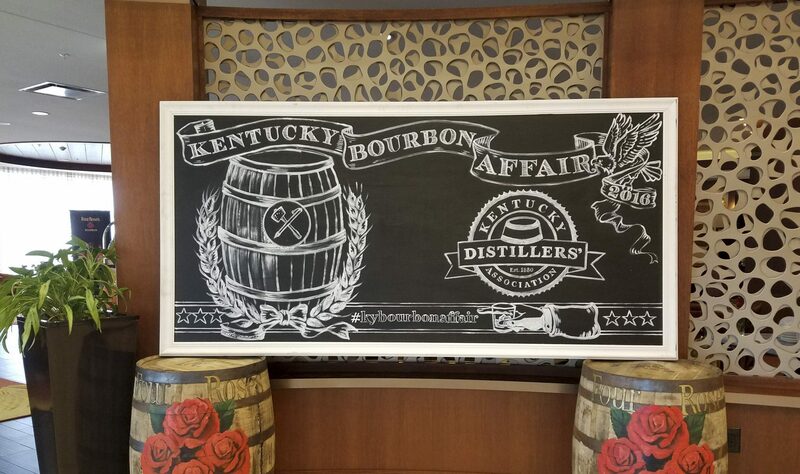 Previous post [Part 2] 2016 Kentucky Bourbon Affair & Whisky Live! Next post Whiskey Thief Tavern, Evanston’s Newest Whiskey Spot!